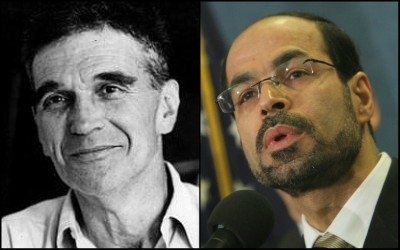 Why Is a Harvard University Student Group Honoring Islamist Extremist Nihad Awad? Nihad Awad is no Robert Coles. In a profile of legendary child psychologist, Harvard professor, and civil rights activist Robert Coles, journalist David Swift describes Coles as "one of our great moral visionaries." To honor Coles's legacy, Harvard University's student-led non-profit group, the Phillips Brooks House Association (PBHA) has admirably named a prestigious annual activists' award after Coles. Less admirably, however, this year the students selected Council on American Islamic Relations' (CAIR) co-founder and executive director Nihad Awad to deliver the 2017 Robert Coles "Call of Service" Lecture and win the coveted award. Nihad Awad is certainly a significant figure, but he is not a "great moral visionary." Instead, Awad has a long history of promoting and condoning Islamist anti-Semitism, refusing to condemn terrorist organizations, and maintaining close connections with Muslim Brotherhood offshoots. Awad has a long history of promoting anti-Semitism and confusing terrorist groups for "liberation movements." 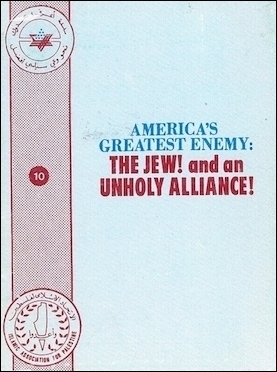 During the early 1990s, when Awad worked for the (now defunct) organization Islamic Association for Palestine (IAP), the organization distributed a pamphlet (stamped with their logo) called "America's Greatest Enemy: The Jew! And an Unholy Alliance!" The anti-Semitic booklet was featured in counterterrorism expert Steven Emerson's 1994 PBS documentary "Terrorists Among Us." According to Emerson, Awad allowed the booklet to be distributed at the 1995 Muslim Arab Youth Association (MAYA) conference in Chicago — which, incidentally, was the same conference at which Muhammad Siyam, a high-ranking Hamas official, told the crowd, "Finish off the Israelis! Kill them all! Exterminate them! No peace, ever!" Awad has also parroted the common anti-Semitic conspiracy theory that Jews control the American government. In a 1998 lecture at Georgetown University, Awad told his audience that U.S. policy is "driven in part by the Jewish origin of many Clinton administration officials." Awad continued, "Who of Clinton's advisors ... is opposing the latest agreement with Iraq? Look at their names. Look at ... their ethnic or religious or racial background. You will see that these are the same groups that belong to the same interest groups in the administration." Awad once worked for the organization that produced this. Somehow, however, Awad's well-publicized public expressions of bigotry did not deter Gene Corbin, Harvard's Assistant Dean of Public Service, from personally presenting Awad with the Robert Coles award. Perhaps Corbin is unaware that Awad, for instance, once referred to the genocidal terror groups Hamas and Hezbollah as simply "liberation movements" in an Arabic-language interview. Or that, in another interview, when Mike Wallace of 60 Minutes asked Awad for his opinion on Hamas, he equivocated: "The United Nations Charter grants people who are under occupation to defend themselves against illegal occupation." Most recently, Awad has applauded the current Turkish Islamist government — which routinely jails dozens of journalists and tortures political prisoners — as "a very impressive example of supporting the oppressed in the Islamic world." PBHA's decision to honor Awad is naive at best, and callous toward victims of Islamist extremism at worst. Is legitimizing terrorism and violence the kind of "public service" that Harvard, the PBHA, and Gene Corbin wish to reward? They don't seem to mind partnering with extremists. One of the sponsors of the event itself — the Islamic Society of Boston — has long established Muslim Brotherhood ties. Its trustees have included the Muslim Brotherhood's spiritual leader Yusuf Al-Qaradawi, who has claimed that Hitler was "divine punishment" for the Jews and has expressed support for suicide bombings. With so much evidence demonstrating Nihad Awad's Islamism, Harvard should have had no difficulties in identifying his contributions and connections to extremist networks. The PBHA's decision to designate Awad as their 2017 honoree is tremendous naivety at best, and at worst, callous disregard for the victims of Islamist extremism. There are many moderate Muslim activists who deserve awards for their dangerous and lonely work. Honoring Awad has tarnished Robert Coles's legacy and does a great disservice to all those fighting the scourge of Islamism. Samantha Rose Mandeles @SRMandeles is a coordinator at Islamist Watch, a project of the Middle East Forum.